After a successful career in the medical device startup world, Joan McLoughlin decided to take a risk and pursue her dream – to open up an art gallery. In 2010, she founded The McLoughlin Gallery, which she thought of as a start up in its own right, the only difference was that this time the products she launched happened to be artists. Located in downtown San Francisco, The McLoughlin Gallery quickly grew and now represents nearly thirty artists working in a variety of media, including painting, sculpture, photography, video, and installation. In thinking about curating her booth for If So, What? she wanted to showcase artists who took a fresh, contemporary approach to their work that mirrored the ethos of the event. She was also interested in artists who addressed important social messages through their practice, including the inequality of women in the workforce, the diversity and mobility of people in today’s hi tech world, space travel, and environmental issues. The McLoughlin Gallery will present works by Raphael Federici, Cristobal Valecillos, and Sarah Ratchye. Federici is a Paris-based artist who brings together street art with a Pop Art sensibility. Drawing on classical painting, spray painting, illustration, and projection, Federici creates works both throughout the streets of Paris and on more conventional materials that address social messages. Interested in the way people move about and communicate today, Federici takes to the streets to spread messages through his art, exploring modern modes of communications. Ratchye too, takes painting as her medium. The locally based artist creates surrealist oil paintings, using what McLoughlin describes as an older style of painting techniques. She draws the images on the canvas, then paints multiple layers of oil to create the final version. Also on view will be works by Cristobal Valecillos, whose performative work Yare, One Last Dance was included in Pacific Standard Time LA/LA this past fall. 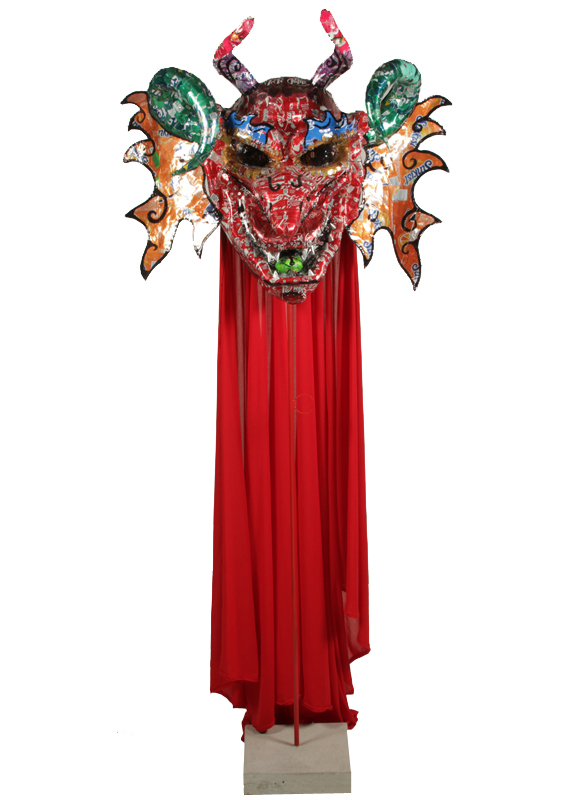 The Work is Yare’s interpretation of the Venezuelan folklore ritual, Los Diablos de Yare, which was cultivated despite efforts of the Church to stamp out indigenous traditions. In 2012, it was declared an Intangible Cultural Heritage of Humanity by UNESCO, preserving the tradition. The ritual itself is one of many rituals involving masks, in this case specifically related to the devil. In this ritual, the use of masks serves as a metaphor for evil, which disappears when in the presence of good. Valecillos’ work features handcrafted 3D masks made from recycled items that address contemporary "sins” such as killings, sugar, pollution, and dogma. The masked characters that Valecillos created were then photographed at iconic locations throughout Los Angeles. Visitors to If So, What? will have the chance to see the captivating prints from this project on view at McLoughlin’s booth. McLoughlin is excited to have the chance to introduce these artists to If So, What? audiences. Following If So, What? the gallery is looking forward to a project called Temporary Art Projects (TAPS), which are short term experiential events that will take place in various cities and countries. According to McLoughlin, the goal is to bring the art to the consumer in association with other cultural activities, creating an art experience to be captured and shared on social media, making art fun. TAPS will be taking place in Danville and Los Angeles California, as well in Basel Switzerland. More information is available on the gallery’s website.